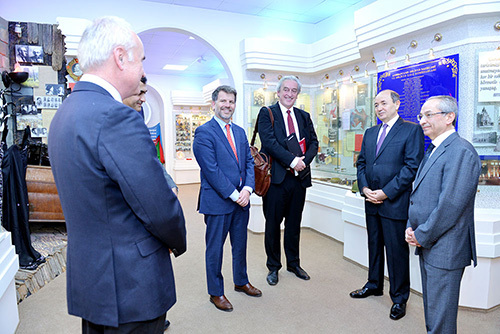 A meeting was held among the head of “Legal approximation towards European standards in the South Caucasus” regional program of German Agency for International Cooperation (GIZ) Thomas Meyer, the former head of the project for Azerbaijan Thomas Herman and his substitute Philipp Jan in the Ministry of Justice. 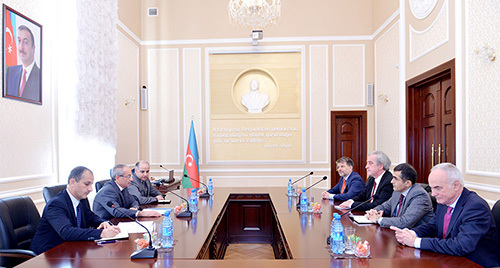 At the meeting that held with deputy Minister of Justice of Azerbaijan Azer Jafarov, was expressed satisfaction for the effective cooperation of GIZ with Azerbaijan and was spoken on the progressive judicial and legal reforms carried out in Azerbaijan, as well as successful results of the project implemented jointly with GIZ in this field. Afterwards, the Minister of Justice, Chairman of Judicial-Legal Council Fikrat Mammadov has received the representatives of GIZ. Having noted that the cooperation with GIZ in legal field is developing successfully, the Minister stressed substantial contributions of GIZ in the large-scale measures implemented on the modernization of judicial and legal system, as well as in the field of administrative justice and judges training and he mentioned his attendance in various measures carried out by the line of organization. Having especially noted T.Herman s services who successfully guided the projects relating to Azerbaijan for a long time, the Minister pointed out the best opportunities for broadening the relations with GIZ and wished successful activity to Philipp Jan, the new head of project. Having noted that they have witnessed the thorough improvement of Azerbaijan, the guests stressed that GIZ was closely cooperating with Azerbaijan nearly 20 years and pointed out they were ready to further deepening of reciprocal activity in legal field. GIZ representatives noted that they have closely followed the reforms in judicial and legal system, met the achievements with interest obtained in this field and highly appreciated the cooperation. The guests got acquainted with Justice History Museum in the ministry.